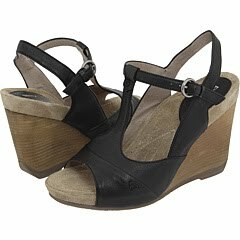 Instead of my normal ‘Subway Style”, this week I’m doing a Sidewalk Style because I really couldn’t resist sharing these delish T-Strap peep toe wedges I spied walking in LA’s Fashion District last week. I was waiting at the corner for the light to change to cross the street when I happened to glance down at the woman’s shoes in front of me and gasped with delight! It was literally one of those double takes like in a cartoon with my eyes bugging out. These are soooo urban boho chic and feminine sweet at the same time! I have been able successfully research them to find out that they are the ‘BV2611’ by Biviel. Now, I was completely new to the Biviel brand. The gal said she got them at Macy’s in New York City, to which I responded, “Of course you did!” (So many of my 'Subway' Styles seem to be purchased there :) ) I asked her what she liked about them and she said that they were incredibly comfortable and go with everything because of the color combination. Its really such a bonus because I can see these working great well into the Fall season with great tights. In looking more into the Biviel brand, I have discovered they are a Spanish shoe company. This just majorly boosted my Spanish shoe obsession (hello?? Blay, Zara and Mango!) What makes this brand more fab is that they use the supplest of Italian calfskins and rubber soles imported from Germany. They self describe themselves as “relaxed feminine” and after looking at a generous sampling of their shoes, sandals and boots, I would also add ‘uber chic’! Their styles are fashion forward yet conservative enough for the office environment in that Anthropologie kind of way. *swoon* I’ve ordered up some snappy boots that I can’t wait to try out and report back on. :) I think that I’m convinced that every Working Girl’s Shoe Closet should have the pleasure of having a pair these pretties in it’s collection.